As much as my daughters love the complex, elaborate toys that they sometimes play with, the ones that seem to always hold their attention the longest are the classic, simple ones. The kind that, whether an educational toy or a building toy or a dramatic play toy, encourages them to use their imagination and rely on their creativity to lead the way. For us, that pretty much always means one name: Guidecraft. And this month, we were able to design and build with ease with their innovative and unique Interlox. 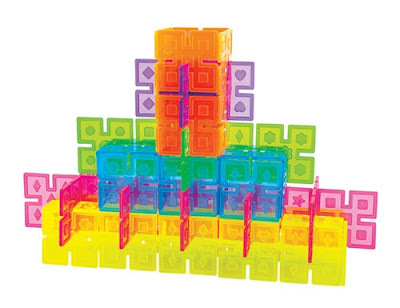 Designed for ages 3 and up, this 96-piece set of translucent plastic square panels come in six bright colors and clip together quickly and easily to create an unlimited number of constructions. 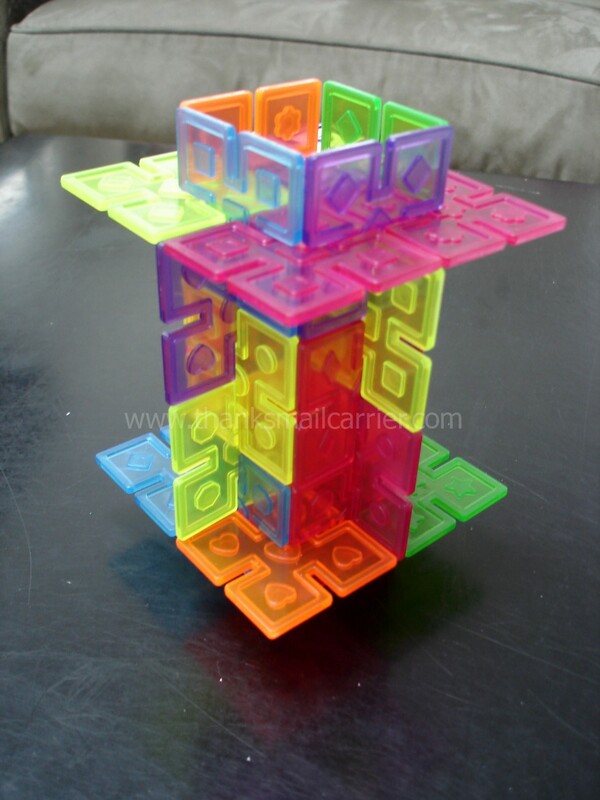 Whether you're dreaming about buildings, robots, animals, superheros, or more, just connect the edges together (by sliding one slot into the next) one by one and build, build, build. Just from the image on the box, Big Sister E and Little Sister B were antsy to begin the open-ended play that Interlox could provide. As we dumped out the pieces onto the table, right away the girls began pointing out the pink, orange, yellow, green, blue, and purple colors. 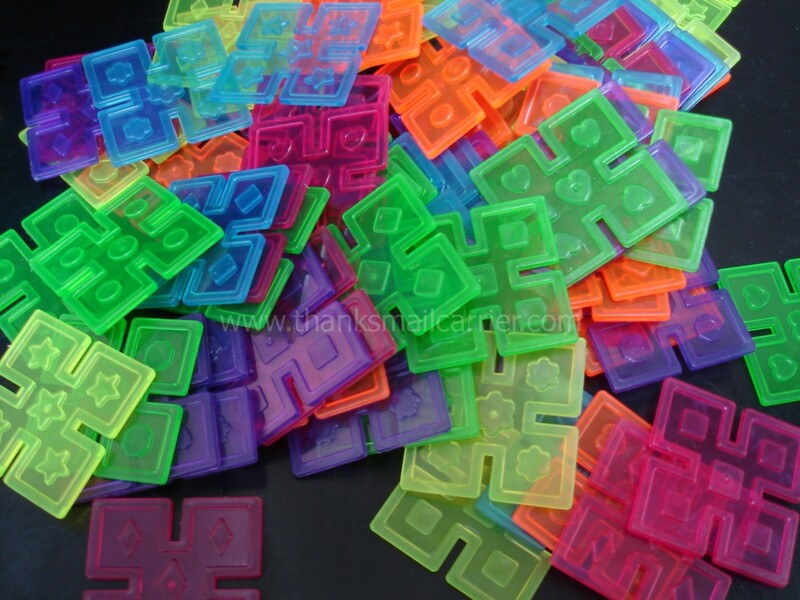 Looking closer, we also noticed that each Interlox has its own shape inset on it and began talking about about the stars, diamonds, circles, flowers, hearts, and octagons that were shown. As to what the girls then decided to create? Well, the sky's the limit! From sorting and stacking to building tall or wide objects, sliding the pieces together was easy for their small hands and they tried some of everything. And then they tried something else. 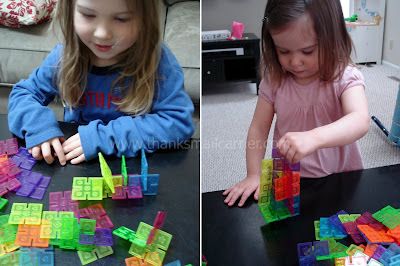 And every day after we opened the Interlox box, they have played with them again! Each time I think that they are going to tire of these colorful squares, the interest level stays high. Not only that, they come up with something new to turn them into, whether the fence of a farm for plastic animals or a rocket ship to the moon. Big Sister E deemed this one a bird feeder. 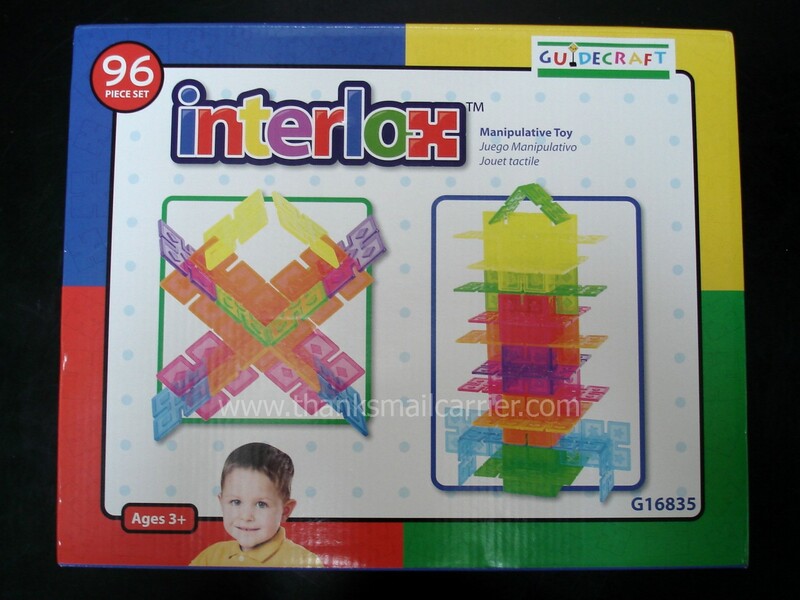 With their ease of use and sturdy, well-made quality, Interlox are a unique addition to any child's play time. The added features of the colors and shapes is a bonus to the manipulative and coordination skills that they enhance as well as the overall imaginative process. In short, they're simple and fun! 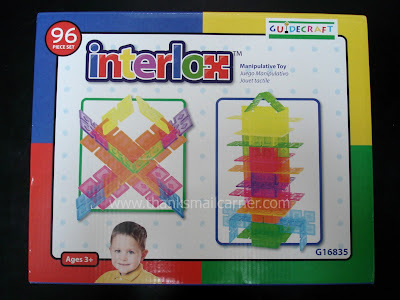 Retailing for $16, Interlox are available directly from Guidecraft on their website, through the shopping link of the NEW Guidecraft Facebook page, or on Amazon. Plus, being that this is an awesome Guidecraft Moms review, that means there is a giveaway for this great item as well! This month it is being held at Along the Way... but only until April 25th, so head over and enter to win! These remind me of a toy from my childhood which I absolutely loved. They were slightly different and more rounded in design, but the idea is the same. The $16 price is more than fair for a construction toy, I think.